21st March 2017, Premier Farnell today announces a new global distribution agreement with EAM, a leading manufacturer of Precision RF & Microwave Interconnect Products. Under their ConductRF Brand, the company offers, innovative & reliable performance interconnect products operating from DC to 110 GHz. ConductRF's products are recognized for their excellent performance and cost effectiveness by engineers & technicians in numerous demanding industries including; Defense, Aerospace, Industrial, Medical Infrastructure, Instrumentation & Test, and Telecommunications. Their product expertise in interconnect technologies makes their solutions desirable around the globe. Premier Farnell's agreement will provide extensive range of ConductRF Solutions for RF & Microwave Test Applications from DC to 70 GHz to customers. Among the ConductRF products, Premier Farnell will stock is their TESTeCON series of Lab Test Cables including Low Loss TSA74 versions. VNA Test needs are well served by rugged VNA Series products to 40 GHz, and their Hi-Flex VNA series with solutions to 50 GHz & 70 GHz. "We couldn't be more excited to announce this new relationship. Premier Farnell is at the forefront of providing innovative products on a global level for a diverse and growing customer base. High-quality RF & Microwave Test & Measurement solutions are essential to many companies, and we firmly believe that Premier Farnell provides significant speed-to-market advantages as well as the highest levels of service and support for engineers & technicians worldwide that use these products." James McGregor, Global Head Test, Tools and Production Supplies at Premier Farnell added: "Premier Farnell views the expansion of the wireless Industrial Internet as a major growth opportunity in 2017 and beyond. Conduct RF have a first class range of cables and test equipment cable assemblies that are of the highest quality and offer some great accessories to assist engineers working in the RF wireless internet field." ConductRF provides wide-ranging solutions for RF Interconnect products. Our RF cable assembly capabilities extend all the way to High-Performance RF VNA Test Cables, operating up to 110 GHz. Our product ranges have suitable options for many specialist applications at various market standard frequency values. We support specific technical characteristic requirements including; Stability, Low Loss, High Power and Low PIM to name only a few. We offer mechanical enhancement including Waterproofing and Armoring. 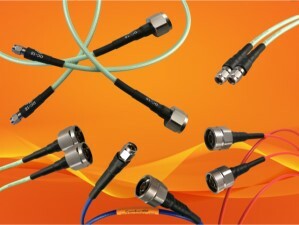 ConductRF offers two extensive ranges of RF connectors. Our precision RF connector ranges include conventional microwave solutions including 1.85 mm & 2.92 mm as well as SMP & SMPM variants. We also offer high-performance stainless steel standards for SMA, N, and TNC and D38999 RF Contact options like BMA and Size#8, 12 & 16. Our commercial RF connector ranges include standard BNC, TNC, N & SMA for typical RG & LMR cable types. Our Low PIM products are used extensively in our Low PIM Cable ranges, but include full ranges of adapters too. ConductRF offers direct customer full customization capabilities for both cable assemblies and connectors to the full extent of our capability. Our test and validation capabilities include High Frequency RF Test, PIM test, X-Ray, Flex Testing & more. Over-molding capabilities were recently installed and are already being feature in some of our custom support activities. Premier Farnell is a business unit of Avnet Electronics Marketing, the components operating group of Avnet, Inc., (NYSE:AVT). Premier Farnell trades as Farnell element14 in Europe, Newark element14 in North America, and element14 throughout Asia Pacific. The Premier Farnell Group is supported by a global supply chain of more than 3,500 suppliers and has an extensive inventory profile developed to anticipate and meet the needs of innovative customers everywhere.